How to create Scenes (Chapters) with Leawo DVD Creator? When it comes to DVD burning or DVD creating, there is one program that cannot be ignored: Leawo DVD Creator. With the exclusive DVD processing technology, Leawo DVD Creator has been one of the most recommended DVD burning program on the market for years, and still trending among DVD DIY enthusiasts. One thing about Leawo DVD Creator that makes it so popular is that, the program provides so many features that can make the DVD we burn look beautiful and professional. DVD menu creation, for instance, is one of the most beloved functions of them all. In Leawo DVD Creator, you can make a beautiful menu and create different chapters or scenes for your DVD. 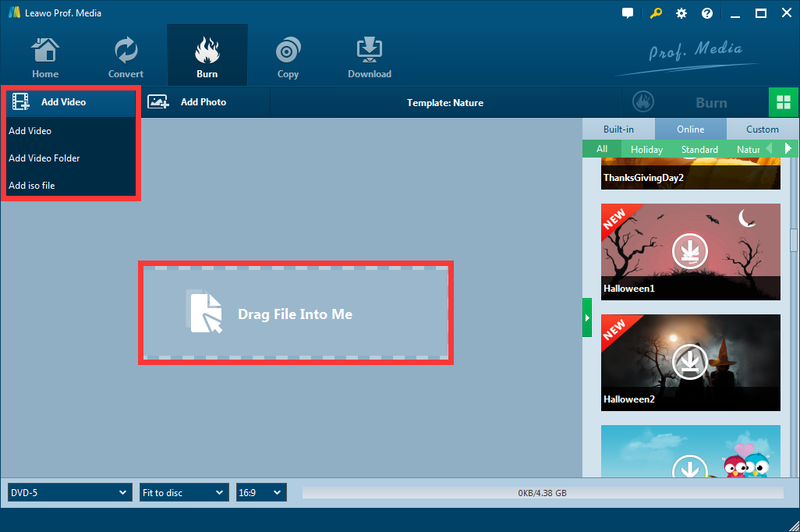 And today, I am going to show you how exactly you can create scenes or chapters within Leawo DVD Creator. DVD menu creation is one of the most important part in Leawo DVD Creator. In the DVD burning program, you can import multiple video clips in bulk, when you create a DVD menu, the system will dispatch different chapters to each clip automatically so that you can have access to any specific clip from your DVD menu quickly. The chapter title, background music and background image are all customizable, and can be saved as new customized template. In order to allow us to create DVD menus in different styles, various DVD menu templates are built-in in the program. These templates are pre-installed so that we can directly use them without worrying about network connection. However, built-in menu templates can only fulfill our very basic needs of menu creation, and they are never enough for our creative minds. That’s why the company also provides online templates, so that there will always be new templates whenever you check out. Creating Chapters in Leawo DVD Creator can be done in minutes, thanks to the user-friendly design of the program. Here is how exactly you can create chapters in Leawo DVD Creator. No matter you are burning video clips or burning photo slideshows, same procedure can be applied. How many chapters you have in the final DVD depends on how many clips you import initially. When you are inside of the Leawo DVD Creator program, Click “Add Video” to add your clips. You can also import clips by dragging the files into the box in the center of the interface in bulk. As you can see, I imported 2 video clips this time. Make sure your clips are in the right order you want them to be in your DVD, otherwise you have to adjust the order by clicking the “up” or “down” arrow on each clip. Now let’s select a menu template for our DVD menu. On the right there is a menu template zone, you can choose any template from built-in, online or customize template library. This time, I choose the “Halloween 2″ from the online library because I think it’s very cool. Click the download button on the template, and it will be downloaded very soon. After the template is downloaded, the download button will become an eye button, meaning “preview”. Click on it, and you will be brought to the menu preview page. This is how your menu will look like in the end. The preview box in the center shows the first chapter image by default. To do some editing, click the pencil icon above the preview window. There are two pages you can edit, the home page, and the chapter page. On the home page, there are two function button, one of which is to play the DVD from the beginning, the other is to bring you to the chapter page so that you can choose chapters. You can change all the textures here, as well as positions of all elements, as you can see in the image below, showing what I did to the home page. After you’re done to this page, click the “1” button above to go to the first chapter page. In the chapter page, you can see that chapters are automatically dispatched to the clips you imported. Change texture and positions, just like you did to the home page. You may have already noticed that the background music and image can always be changed by clicking the buttons below, and you can save the current settings as a new template by clicking the hard disk icon. All looks good. We can now click the green “Burn” button to proceed to burning settings, or click the “start” icon to go back and do some other settings to our clips. Now the two clips we imported are dispatched as two different chapters, and can be accessed from the menu page separately. To test the final DVD, I played it on my PC with Leawo Blu-ray Player (This is a solid free Blu-ray/DVD player, very powerful, strongly recommended! ), and this is how it looks like. 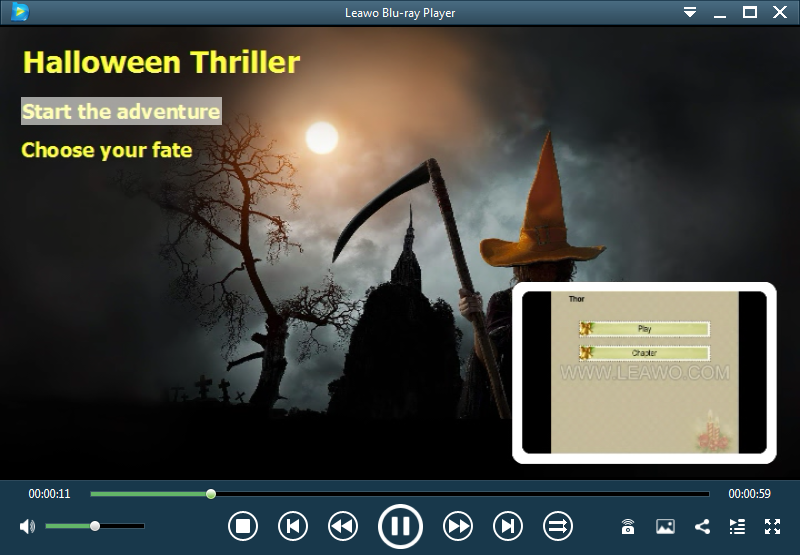 Creating DVD menu and chapters in Leawo DVD Creator is a very pleasant experience. There are no obstacles throughout the whole process, and the final DVD looks really amazing. All chapters can be accessed from there, and the menu is fully compatible with all the DVD players and Blu-ray players on the market and Leawo Blu-ray Player on PC as well. Looks like Leawo DVD Creator doesn’t fail its reputations.